Meet the decorating superstar Wallpaper For Windows, a special adhesive-free film that is the easy “DIY” (do-it-yourself) way to decorate windows, glass doors, showers and mirrors with the look of stained glass, etched and frosted glass. This minute and a half video demonstrates the features and benefits of a decorating superstar; with decorating ideas and how-to add privacy and partial privacy information. See Wallpaper For Windows give mirrored closet doors and mirrored walls a new look using see-through or privacy films. Recommended for homes, apartments, offices, medical facilities, churches and more. At work, this superstar provides new opportunities for offices and businesses to economically create decorative environments for employees and customers. Why choose decorative window film? Why not? 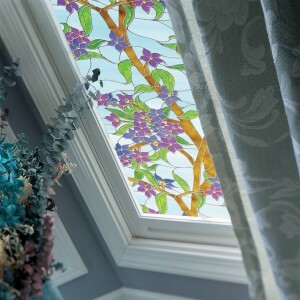 Window film is couture for the home! Only affordable. And who doesn’t want a pair of Jimmy Choo’s…with a Target price tag? Seriously, value has become the main consideration for everything. We expect high quality, long lasting products that are affordable yet still look good. Thanks to HGTV, Extreme Makeover and the like, we’re very familiar with redecorating techniques. What we don’t have is Ty Pennington, with his crew and BUDGET, to pull off our make-over! That’s why window film makes sense. There are specific film products that will decorate windows to hide a nasty view, while still letting the “free” light in. Some films cut down on glare and heat which slash costly energy bills. In some cases, a decorative film transforms a window or door into a piece of art providing both beauty and privacy. Film is WAY affordable compared to other window treatments. And could it be easier? You can get it direct from the manufacturer, so it gets to you quickly and with a 3 year limited warranty – it’s no fake Rolex. Here is where the couture part comes. You can have a standard window or glass door or you can have an oddly shaped window, a plus-sized door or a petite-sized transom, and it will still end up looking “made to order”. Wallpaper for Windows is the only window film company that offers a “Trim To Size” service to make the window film project even easier. If you like to do it yourself, the film is easy to cut and fit because the film is thicker than other brands, making it so easy to handle that you’ll feel like a Project Runway finalist. There is no mess since the vinyl clings to the glass without adhesive. 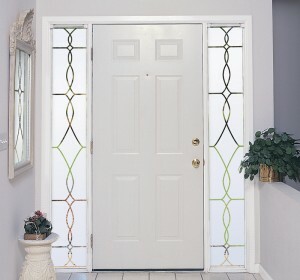 The larger size films fit the plus size doors, and there are so many different designs that the combinations are as variable as Lotto numbers. With all that, you can “make it work” in any room. If you have owned your home long enough, you may remember the older sticks on contact adhesive frosted glass window film that was available. The unattractive product was more functional than pretty, but the need for privacy prevailed. Today, there is a new generation of good looking frosted films that have become artistic design additions to homes and offices. These are what you may wish to use to get that privacy plus beauty that you are seeking. Beware of cheap window films, they typically don’t look as good as ones that only cost a few dollars more and often are thin adhesive films that are difficult to apply and even more difficult to remove (don’t believe the “easy to remove” statements on the box or website, you want to use an adhesive-free static cling film) There are frosted glass films that are opaque and provide maximum privacy. Lite Frost films that are translucent, and one company, Wallpaper For Windows that has frosted films in colors other than white. Some of the artistic films you may like include etched designs, such as leaves, lace, or many abstract patterns. These films are made of plastic that may be easily washed with soap and water. And for all their lovely appearance, some also provide protection from UV light that can fade your furnishings and harm your skin. These films are great for windows, but you may also consider using them on any glassed area in your home. Some films look particularly stylish used on room dividers and shower doors, and kitchen cabinet doors. The films allow light to shine through and still mask the view or contents from public view. The beautiful look of etched glass does not have to cost a fortune. The simple fact is you can decorate windows or doors with nice looking, reasonable costing etched glass window film. It really is easy to apply and can last for many years making it very economical. Choose from many styles and desirable designs and whatever level of privacy you require. At one time window treatments were mainly structured around blinds, curtains or shutters. Using glass film opens up a whole new choice to explore. Window film can be purchased in glacial, stained glass, frosted or etched designs. We just received the premiere issue of Window Covering News Magazine. Judging from this first issue it will be a good source of information. The magazine includes new and innovative products, news and events in the industry, featured workrooms, design ideas, vendor spotlights, new trends in the industry, business articles, how-to articles, and much more. One we really liked was “New Way To Decorate Glass With Color” featuring Deco Tints by Wallpaper For Windows.